Ah, mini quilts – aren’t they fun? You can sew them up in an afternoon, entirely from your stash. They can be used as wall decorations, front door decorations, table toppers or runners. And of course, they make great last minute handmade gifts. This mini quilt pattern, which I’m calling the Ribbon Heart mini, could be a sweet handmade addition to a baby nursery or a Valentine gift for a crafty friend. 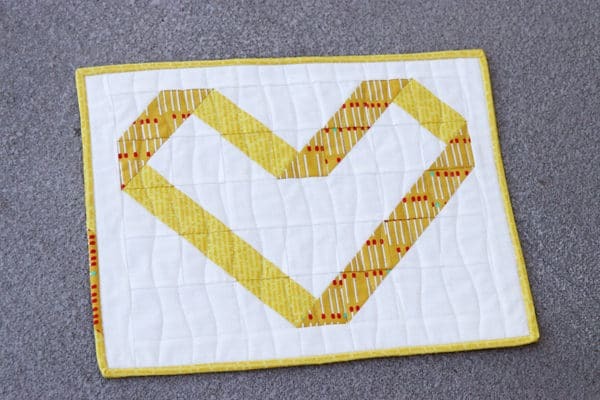 The Ribbon Heart mini quilt finishes at 16.5″ x 12.5″. The instructions and diagrams are detailed and show you exactly how to make sure your directional pattern fabrics all face the same way across the pattern. I like it when my stripes are all aligned. It’s just a little detail that makes me happy! Hopefully these instructions will be useful for other patterns too. It can be hard to visualise how patterns should be oriented in blocks to make sure they all match when sewn together. 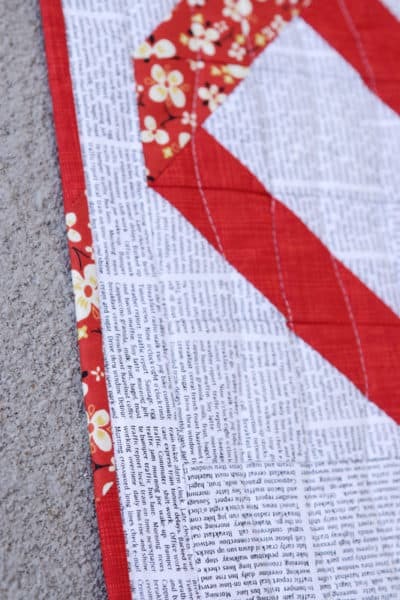 I liked the idea of a small contrasting piece of fabric in the binding, so the pattern has instructions for that too. I have another version almost finished. This will be a striped blue and green Ribbon Heart, with some IKEA hippos on the back. Perfect for a baby nursery. I had two lovely testers make some versions of the pattern as well. First up, Kimberly (from Autumn Hollow Patchwork) made a very Valentine version in pink and red stripes. Amy (from Stitchy Mitten) also made a couple of test mini quilts, with very groovy quilting. I quilted my versions with wavy lines using my walking foot. 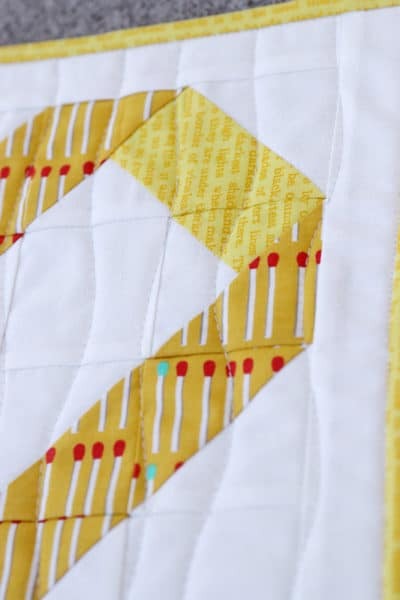 Probably should have done some matchstick quilting on this one though… given all the matchsticks. So that’s the Ribbon Heart Mini Quilt! If you’d like to make your own version, and be deeply fulfilled by having your stripes all face the right way, then you can find the pattern listed here in my shop. I’m glad I’m not the only one 🙂 I feel very smug when they’re all in line! Sorry…should read Kirsty. Don’t like it when spell check puts words in my mouth! That’s so pretty! I am a terrible quilter, but a mini quilt might be manageable, and this would be so cute for the kids’ bedroom.